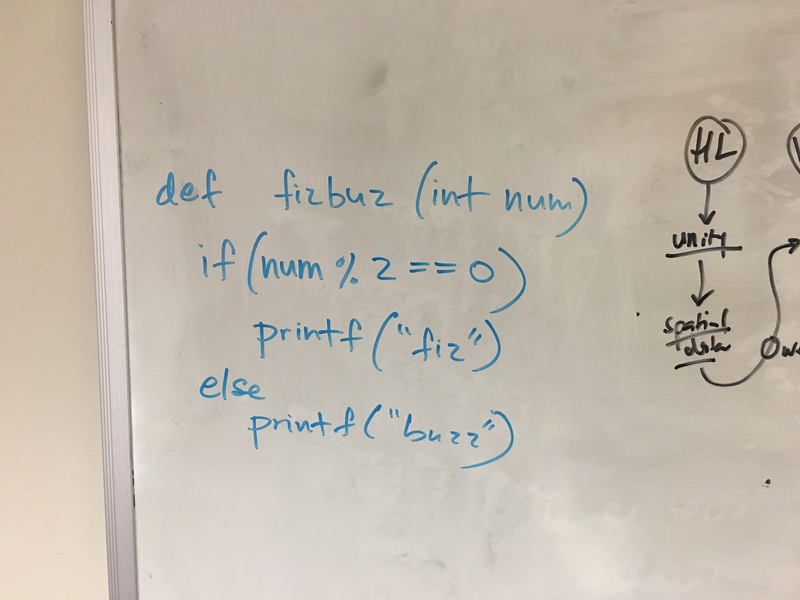 How would you code in C to make the computer fizz when it finds an even number and buzz when it finds an odd number? Next we’ll build from this simple little code snippet into a programming adventure that will reveal the importance of pointers and addresses, compiler specific caveats, and data type reveals! How would you update the code in C to have the computer take in an array of numbers? I want the problem of data types in C to reveal itself in the exercise. Just asked him to update the code to fizz on chars and buzz on ints. Very interested to see how he approaches this! How would you code in C to have the computer fizz on chars and buzz on ints? Reading over the code, the concept started to open itself up. I remember reading somewhere, “In order to recreate you must first break it into pieces.” If you listen closely you can hear the problem cracking. I emailed J the following. How would you code in C to have the computer fizz for a char and buzz for an int? We are no longer checking for even or odd. We are checking datatypes. Very interested in seeing the code that comes from this request. Will he get it? UPDATE 3: With a single import of ctype.h, J was able to check to see if the current element in the array is an alpha character or a numeric character. Not exactly what I was looking for but who’s at fault when the problem is not clearly defined? I decided to be clearer in my instructions. How can I phrase the question without having to indicate how to solve it? How would you code in C to make the computer create an array of ints and longs then fizz for ints and buzz for longs? I just found that the size of an int and long are both 4 bytes. Did you want me to compare another datatype? Good going! Please update code to fizz for int and buzz for unsigned int. I’m looking forward to what he discovers along the way!